SALT LAKE CITY – The next time the sky darkens with a flock of noisy unwelcome starlings, blame Shakespeare — or, better yet, a few of his strangest fans. Had the Bard not mentioned the starling in the third scene of "Henry IV," arguably the most hated bird in North America might never have arrived. In the early 1890s, about 100 European starlings were released in New York City's Central Park by a group dedicated to bringing to America every bird ever mentioned by Shakespeare. Today, it's more like Hitchcock. Some 200 million shiny black European starlings crowd North America, from the cool climes of Alaska to the balmy reaches of Mexico's Baja peninsula. The enormous flocks endanger air travel, mob cattle operations, chase off native songbirds, roost on city blocks, leaving behind corrosive, foul-smelling droppings and hundreds of millions of dollars of damage each year. And getting rid of them is near impossible. Last year U.S. government agents poisoned, shot and trapped 1.7 million starlings, more than any other nuisance species, according to new figures, only to see them roaring back again. "It's sort of like bailing the ocean with a thimble," said Richard Dolbeer, a retired Wildlife Services researcher in Sandusky, Ohio who spent years trying to figure out ways to keep starlings — which he calls "flying bullets" — and other birds from causing problems at airports. Federal aviation officials say they have caused $4 million in damage since 1990. After the starlings' introduction, they quickly expanded west, taking advantage of vast tracts of forested land opening up to agriculture and human development, Dolbeer said. 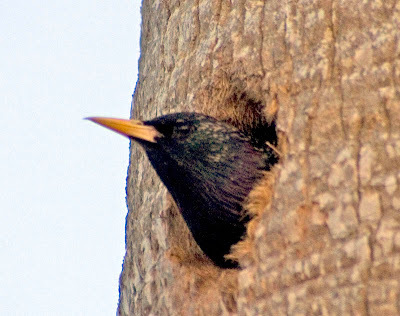 By the 1950s, starlings had reached California and nearly all parts in-between. Today, it's one of the most common birds in the U.S.
Their prodigious presence is no mystery. 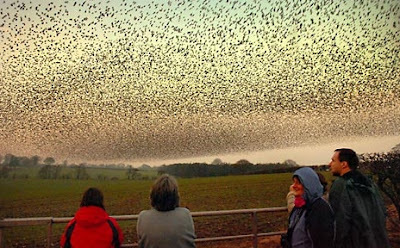 Starlings breed like crazy, eat almost anything, are highly mobile and operate in overwhelming numbers. They're also expert at nesting in protected nooks and making an intimidating statement as they swirl in vast clouds called "murmurations." "They're great survivors and quite the biological machine," said Greg Butcher, director of bird conservation at the National Audubon Society. They're also responsible for the most deadly bird strikes in aviation: a 1960 civilian crash in Boston that killed 62 and a 1996 military cargo plane crash that killed 34 in the Netherlands. Since then, there have been close calls, including a Boeing 747 that ran into a flock in Rome last fall. No one was killed but the badly damaged plane had a rough landing. Those kinds of scenarios are why wildlife biologist Mike Smith has been tweaking a series of traps used at Salt Lake City International Airport, where there have been 19 reported starling strikes since 1990. The traps use dog food to attract a starling or two. Hundreds more soon follow, driven by their innate desire to flock with each other. He once caught 800 in a single day. The most popular lethal tactic is a poison called DRC-1339, which is often sprinkled on french fries, a favorite starlings snack. Within a day or two, starlings keel over from organ failure. No other state poisoned more starlings last year than Washington. Starlings there caused $9 million in damages to agricultural operations over five years. Nationwide, starlings cause $800 million in damage to agricultural operations each year, according to a Cornell University estimate. At one feed lot, some 200,000 starlings gathered each day, lining fence tops, wires, water troughs and even perching on top of cows. They've learned to steal the most nutritious morsels from the cattle troughs and pose an ever-present threat of moving disease from one ranch to another, said Roger Woodruff, director of Wildlife Services in Washington. Nearly 650,000 starlings were poisoned last year in the state, an all-time record, he said. When killing's not an option, agents often turn to harassment campaigns. In downtown Indianapolis, flocks as large as 40,000 show up around dusk in the winter to hang out, find food and keep warm. They quickly wear out their welcome with their noise and their mess. Crews are deployed nearly every night to scare them off with lasers, pyrotechnic explosions and noise devices with names like "screamers" and "bangers." Like other urban areas, they've had some success shooing them out of downtown and onto undeveloped land, said Judy Loven, director of Wildlife Services in Indiana, but it's likely going to be an ongoing battle. "They're pretty much wise to our ways and pass that information along," said Jeff Homan, a wildlife researcher in Bismarck, N.D., who's part of a team focusing on starlings and blackbirds. It's unlikely those who engineered the starlings' release in Central Park — including its leader, New York drug manufacturer named Eugene Schieffelin — could have fully imagined the consequences of their experiment, said author Kim Todd, who wrote about the introduction in her 2001 book "Tinkering With Eden: A Natural History of Exotic Species in America." "It's sad but true that we often only see a creature's beauty when it is out-of-reach or rare," Todd said in an e-mail. "I can't imagine that Schieffelin, who appreciated starlings on the page and in small groups, would have the same affection for them in their enormous, pesky flocks." Unfortunately it looks like these birds need to be taken out. They are going to put a strain on native species and could cause them to become endangered or extinct. This is clearly why humans shouldn't move around animals to environments that can't handle them. Unfortunately it looks like these ***slur deleted*** need to be taken out. They are going to put a strain on native [kinds] and could cause them to become endangered or extinct. This is clearly why humans shouldn't move around to environments that can't handle them. When you take a step outside Humanity, you realise we're just animals after all, with the same natures and patterns as these witless Birds. That was the pin in my heart's coffin really. I learnt to think like a Naturalist. It is very obvious that these starlings are fitter and more successful than the native species they are outcrowding, harassing, and replacing. So shouldn't a Darwinist be on the side of the starling? No, an ecosystem must be considered as a whole, and whether it functions as a whole or not. One invasive species can destroy hundreds of native, harm the balance achieved over thousands of starling-free years, and puts the entire ecosystem, or society, at risk, ironically, through its oversuccess. Oversuccess can be bad. It seems anti-Darwinistic and contradictory at first, but oversuccessful species strip resources at an unsustainable rate. I've dropped the metaphor and I'm only talking about animals now and species as a whole, but, I'm including Humans as a whole as an oversuccessful species. We have such an impact because our oversuccess leads to an unsustainable rate of population growth. When this happens, a species becomes a burden to its ecosystem and all the other species which naturally thrive there, sustainably. Gradually, the land gives out. First resources run slim, and the reasonably successful are affected before the oversuccessful. Some of these species outcrowded are ultimately keystone species, who just by their existence, sustain and play a vital role in every part of the ecosystem. When they are gone, they trigger a chain reaction, a mass extinction, and Nature is lucky if she can pick up the pieces and start over. I believe that climate change, meteors, and miscellaneous changes in abiotic environment play only an ancillary role in many mass extinctions. I believe oversuccess is probably always at least linked to the main cause and usually the red herring itself, the reason being that we are within a mass extinction at this very moment, and we are lucky enough to be able to observe the cause. Alia, there is only once species of hominid on this earth.